Date palm was considered the main social and economic crop in Saudi Arabia especially in desert region. The study was carried out to evaluate the distribution and incidence of various fungal diseases on date palm in major growing tracts of Najran. Survey was conducted during September 2010 and May 2011. A total of 25 locations distributed in seven districts were subjected for the study. The survey was conducted in several nurseries, private and public areas, while the isolation was performed on Potato Dextrose Agar (PDA) medium plates. The identification of fungal isolates depend on classic method and also advanced generation of BIOLOG system. The major diseases noticed in survey was offshoot decline, leaf spots, black scorch, leaf basal rot, leaf blight and bunch disorder. The diseases symptoms on different date palm cultivars were described. Fourteen different fungal species belong to eleven genera were associated with date palm cultivars exhibited different disease symptoms. The results of pathogencity test elucidated the pathogenic effect of eleven fungal species. Leaf spots disease was the most important, varied in shape and size and its incidence on individual farms. Helminthosporium sp., Dreschlera spicifera, Alternaria alternata and Sordaria fimicola were involved in the leaf spots and leaf blight diseases. Botryodiplodia theaobromae and Colletotrichum acutatum were the predominant pathogens found to be associated with offshoots decline and Ch. punctulata was identified as the causal agent of black scorch on date palm. The recording of C. acutatum, Sordaria fimicola, F.ventricosum and F. torulosum as true pathogen on date palm was the first time in Saudi Arabia. M.I. Ammar and M.A. El-Naggar, 2011. Date Palm (Phoenix dactylifera L.) Fungal Diseases in Najran, Saudi Arabia. International Journal of Plant Pathology, 2: 126-135. Date palm (Phoenix dactylifera L.) is an important fruit crop in the Kingdom of Saudi Arabia and bears a lot on the national economy. Therefore, the government is paying special attention to date production through price support of low grade variety and providing subsidies to the most important production variables (Alshuaibi, 2011). Date palm is the major fruit crop of arid, deserts in tropical and subtropical areas. According to FAO report, world date-fruit production reached up to 16.7 million tons from about 100 million tree, distributed in 30 countries. In Saudi Arabia, date palm is the most important cash and fruit crop grown in the different regions covering approximately 72% of the total area under permanent crops represent 161.975 ha where 23 million trees produce 991.660 tons of dates (Anonymous, 2009). The world production of dates has increased 2.9 times over 40 years, whereas the world population has doubled. In many ways, dates may be considered as an almost ideal food, providing a wide range of essential nutrients and potential health benefits. Dates fruits are cheap to produce preserve and are also very rich in nutrition. The flesh of dates contains a high percentage of carbohydrate (44-88%), protein (2.3-5.6%) and dietary fibre (6.4-11.5%). The fat percentage reach to (0.2-0.5%), including 14 types of fatty acids (Alkahtani et al., 2011). Date palm infected with several fungi resulting in decline of the growth and production. Several fungal diseases of date palm trees have been reported from many date producing countries. The most common disease of date palm was Bayoud disease caused by Fusarium oxysporum f.sp. albedinis. This disease is the most serious date palm disease especially in Moracco and Algeria (Elarosi, 1989; El-Hassni et al., 2005; Chakroune et al., 2008). The Inflorescence rot (Khamedj), Black scorch, rooting of aerial offshoots and Leaf spots are considered of date palm serious diseases (Al-Rokibah, 1991; Al-Obeed, 2005). Under local conditions of Saudi Arabia, date palm trees are vulnerable to infection with some destructive diseases which are responsible for decline and considerable losses in the number of trees or its yield. Several soil borne fungi attach date palm causing root rot, wilt and decline diseases (Abdalla et al., 2000). The dominant fungi associated with date palm are: Thielaviopsis paradoxa (Black scorch), Botryodiplodia theobromae (Basal rot), Maugniella scattae (Inflorescence rot), Heminthosporium spp. and Alternaria spp (leaf spots) (Abdalla et al., 2001; Al-sharidy and Molan, 2008). According to available literatures, no previous data was published on date palm fungal diseases in Najran region, yet survey of fungi on date palm were not made until recently. An effective strategy for combating plant diseases requires a thorough knowledge of the pathogens. The main aim of this study was to assess the geographical distribution of date palm diseases in Najran region. The determination of date palm incidence was depended on isolation and identification of fungal species associated with the diseases. The intend of pathogenic capability to provide update information on the most important diseases which affecting date palm in this region. Area of study: This study was conducted during the period from September 2010 to May 2011 in Najran province. It consists of several scattered date palm plantations with different cultivars. The total number of date palm trees is estimated to be around 533360 individuals with the total area about 3367 ha, produce 21021 tons (Anonymous, 2009). Survey for the disease incidence: Date palm trees were surveyed in several nurseries, private and public areas such as gardens, palm plantations on avenues, streets of Najran provinces. In total, 25 orchards were inspected in seven districts. The symptoms on date palms trees were recorded whether overt or hidden in each district as percentage. The palm trees showing individual differentiation in diseases symptoms and total percentage of these symptoms. The disease incidence was determined by counting the number of visible infected trees per farm in according to the total number of trees in each farm. Isolation and identification: Samples of affected tissues of symptomatic trees represents different parts of infected tree collected from various localities were kept in plastic bags and transferred to laboratory for investigation. Individually samples were cuts into small pieces 0.5 cm, surface sterilized for 2 min in a Sodium Hypochlorite solution (1.5%), washed twice with sterile distilled water and placed on Potato Dextrose Agar (PDA) medium plates supplemented with 0.5 mg mL-1 of streptomycin and incubated for 3-7 days at 28°C. Emerged colonies from the tissue pieces were transferred to PDA and incubated at 28°C for 10 days. The single spore was transferred to a PDA slants and stored at 4°C for further studies. Colonies were described according to morphological characteristics, examined under microscope and the frequency (%) of the isolated fungi was recorded. Specific keys and references are used to identify the fungi to the genus level (according to the taxonomic systems of Ellis (1971), Barnett and Hunter (1972), Nelson et al. (1983) and Paulin-Mahady et al. (2002). Isolates well be deposited in the National Research Central Lab., GSFMO, KSA for further identification using BIOLOG (Gen III) supported from BIOLOG, Inc. Hayward USA. Evaluate the pathogenic capability: Pathogenicity tests were conducted in vitro on healthy detached samples representing different parts of date palm (rachis, stalks). The most predominant fungi isolated from individual symptoms representing different locations and cultivars were tested for its pathogenic capabilities. Healthy cuttings 25 cm long of the middle part of offshoots rachis and stalks of Barhi cultivar were surface sterilized with 70% ethyl alcohol. The desired fungi well grow separately on PDA medium in Petri dishes for seven days at 28°C. For inoculation, pieces of the desired fungal growth were inserted into artificially made wounds (5 mm longx3 mm deep) made at the center of each cuttings. Proper controls were also prepared using PDA agar plug without pathogen. Three replicate were used for each treatment. All inoculated cuttings, stalks and pinnae were kept in plastic boxes supplemented with wet cotton at room temperature according to the methods described by Molan et al. (2004) and Kararah and Ammar (2003). The size of damaged affected tissues around the point of inoculation was measured (mm) 10 days after inoculations. Data analysis: Results were expressed as Means±SE and differences between means were statistically analyzed using an Analysis of Variance (ANOVA) according to Tukeys test through an SPSS 15.0 software package in Microsoft Windows 7 operating system. 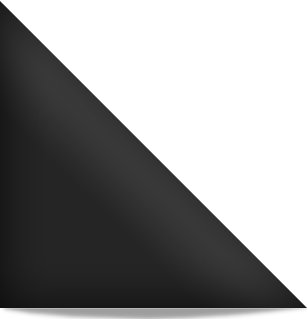 Differences are considered significant when p≤0.05. Survey: The main diseases noticed during survey was offshoot decline, leaf spots, black scorch, leaf basal rot, leaf dieback, leaf blight, bunch disorder and false bayoud. Some orchards were found free from fungal infection. Leaf spots had the highest disease incidence to the other diseases in most of the districts (Table 1). Black scorch was found to be the major symptoms in most of the new plantations, disease incidence ranged from 1.0-1.67%. In different locations, new plantations were usually most heavy infection with several types of disease symptoms. Isolated fungi and pathogenic capability: Fifteen fungi associated with date palm disease symptoms were identified to genus and where possible species level. They included thirteen deuteromycetes ; two ascomycetes (Table 2). The majority of isolates were obtained from leaves exhibited leaf spots where, symptoms was noticed at most collecting sites and varied in shape and size in different areas. The isolated fungi from leaf spots belong to fungal species; Helminthosporium sp., Derschlera spicifera, Alternaria alternata, Fusarium torulosum, Sordaria fimicola and Chaetomium sp. 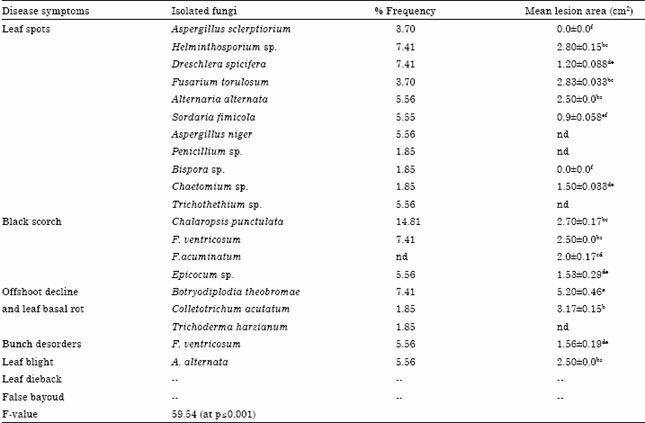 The percentage of frequency show the predominance of the first three fungal species (Table 2). In general , Ch. punctulata (Synonym = T. punctulata) was the most frequently isolated fungi from sample exhibited black scorch symptoms (14.81%). Botryodiplodia theobromae was the most dominant fungi isolated from offshoot decline and leaf basal rot (7.41%) and surprising Colletotrichum acutatum were also isolated as pathogen from declined offshoots. Fusarium ventricosum was the main fungus isolated from bunch disorder symptoms. Although leaves samples exhibited dieback was collected, it was impossible to elucidate the cause of the disease. Also, false bayoud symptoms were showed with neglected occurrence but, numerous attempts failed to isolate any pathogen. Thus, more than one fungal genera for isolates collected from field samples were pathogenic under laboratory conditions. Among the 20 fungal isolates obtained from different date palm parts exhibited various diseases symptoms, fourteen were pathogenic. The rest of the isolates belonged to Aspergillus sclerptiorium, Bispora sp., Penicillium sp., Trichothethium sp. and Trichoderma harzianum was non-pathogenic (Table 2).The association of Fusarium torulosum and Sordaria fimicola with leaf spots; C. acutatum with offshoots decline and F. ventricosum with bunch disorder were observed as new reports on date palm in Saudi Arabia. Leaf spots: Most leaf spots disease symptoms develop as small scattered , irregular to oval brown to black spots about 2-5 mm in length on both the upper and lower surface of rachis midrib (Fig. 1a, b). Sometimes, the spots enlarged to form a blighted area concentrated on the lower part of rachis (Fig. 1c, d). Leaf blight and cankers: Symptoms appeared as elongated brown to black spots which enlarged on wide area causing cankers on the midrib (Fig. 2a, b). Sometimes spots extended on both rachis surface causing death of pinnae and spines (Fig. 2c). Offshoots decline and leaf basal rot: Offshoots decline symptoms started on the central young leaves then gradually infect the outside leaves and may leading to the offshoot death (Fig. 3a). Leaf basal rot appears on the outer leaves of older palms as a black blight area extending along the leaf base (Fig. 3b). In severe cases, with infection progress, infection lead to the death of rachis. Black scorch: Symptoms often expressed as black scorched leaves, leaf malformation (Fig. 4b) and characterized by partial to complete necrosis of the tissues. In severe cases, the pathogen attacks the terminal bud causing heart rot (Fig. 4a). Bunch disorders (wilt): Longitudinal pale brownish stripes with yellow edges appear on stalks of diseased bunches. Date fruits usually wilt and eventually whole bunch dry. Date palm diseases are among the major factors that affecting the products. Fungi are known as the most causal pathogens on date palm trees (Zaid et al., 2002). The present study showed limited spread of fungal diseases on date palm trees in the surveyed area because of the dry conditions and high temperature for most of the year. The results indicated that leaf spots, leaf blight and black scorch is widespread but high incidence of such diseases is expected especially in the absence of any control measures which may represent a real problem for date palm cultivation in future. Such diseases are common on similar climate conditions in other districts in Saudi Arabia as reported by Sheir et al. (1981), Al-Rokibah (1991), Suleman et al. (2001) and Al-sharidy and Molan (2008). Despite the widespread of leaf spots diseases, we noticed complete absence of Graphiola leaf spot; this may due to the dry climate. Black scorch disease had relatively high incidence and infection concentrated on new plantations. This may attributed to the entry of the pathogen through offshoots coming from outside Najran region. Chalaropsis punctulata, B. theobromae, Dreschlera spicifera, Fusarium spp., Helminthosporium sp. and A. alternata was the most predominant species isolated from visibly diseases palm of our survey and was pathogenic 10 days after inoculation, confirming kochs postulates. Similar findings were reported by El-Meleigi et al. (1986), Najeeb (2001), Sarhan (2001), Suleman et al. (2002), Al-Sharidy and Molan (2008), Abdullah et al. (2009) and Hernandez et al. (2010). Fusarium ventricosum is involved in date palm bunch disorder. Recently, bunch disorder of date palm has extended in Iran and several investigations have been conducted to identify the responsible agents but so far these works not success (Karampour, 1999; Karampour and Pejman, 2007). Many scientists believe that unsuitable climatic conditions such as high temperature, hot winds and low humidity influence the disease incidence (Shirazi et al., 2008). 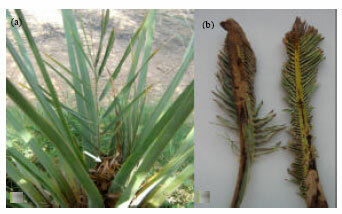 Many fungal species have been isolated from affected date palm with no direct and/or had primary role in occurrence of bunch disorder (Karampour and Pejman, 2007). Under Saudi Arabia conditions, Fuasarium moniliforme was reported as a causal pathogen of bunch disorder (El-Meleigi, 2004). Isolation procedures from rachis exhibited dieback and false bayoud symptoms failed to elucidate any pathogens (Ammar and Najeeb, 2004; Djerbi, 1983). Leaf dieback symptoms may occurred as physiological reaction to transplanting adult palms with injury of their root system (Djerbi, 1983). 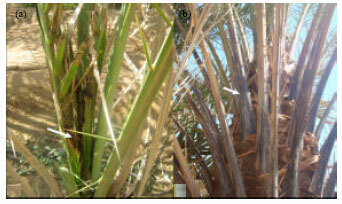 During present investigation, date palm offshoots showed decline symptoms were noticed in one district. The main fungal species isolated was identify as B. theobromae and surprisingly, Colletotrichum acutatum. Colletotrichum were associated with decline symptoms in one farm where, date palm and lemon (Citrus limon) trees were intercropped together in farm. Lemon trees could provide canopies for date palm offshoots so that the microclimate in the farm could favor the disease development with high humidity (Masyahit et al., 2009; Abouziena et al., 2010). Very little experimental work documents Colletotrichum as the cause of palm diseases, although the association or presence of Colletotrichum with leaf spots has been reported from many palm-growing areas in the world. To date, the Glomerella stage of the pathogen Colletotrichum were isolated from red sealing wax palm, coconut palm causing leaf spots and reported as causal pathogen of leaf blight of date palm (Al-Rokibah, 1991) and olive fruits (Duarte et al., 2010). In conclusion, despite the diseases observed a cross the districts surveyed, we noticed that, most farmers lacked knowledge on disease identification and had limited resources for disease or insects management. In addition, they do not use any strategies to control diseases. There is need to educate farmers on infections diagnosis and management of palm diseases through field demonstrations and field guide as extension releases. Scouting for initial disease symptoms is also important because it enables timely control and this would minimize losses attributed to diseases. This study was funded by grant from Deanship of Scientific Research, Najran University. Abdalla, M.Y., A. Al-Rokibah, A. Moretti and G. Mule, 2000. Pathogenicity of toxigenic Fusarium proliferatum from date palm in Saudi Arabia. Plant Dis., 84: 321-324. Abdalla, M.Y., G.H. Ibrahim, A.A. Al-Mihanna and A.A. Al-Rokibah, 2001. Brown leaf spot of date palm in Saudi Arabia and the influence of leaf Epicuticular wax on disease severity. J. Adv. Agric. Res., 6: 585-593. Abdullah, S.K., L. Asensio, E. Monfort, S. Gomez-Vidal, J. Salinas, L.V.L. Lorca and H.B. Jansson, 2009. Incidence of the two date palm pathogens, Thielaviopsis paradoxa and T. punctulata in soil from date palm plantations in Elx, South-East Spain. J. Plant Protection Res., 49: 276-279. Abouziena, H.F.H., E.Z. Abd El-Motty, R.A. Youssef and A.F. Sahab, 2010. Efficacy of intercropping Mango, Mandarin or Egyptian Clover plants with date palm on soil properties, rhizosphere microflora and quality and quantity of date fruits. J. Am. Sci., 6: 230-238. Al-Obeed, R.S., 2005. Rooting of aerial offshoots of four date palm (Phoenix dactylifera L.) cultivars by air layering method using polyethylene bags. Pak. J. Biol. Sci., 8: 978-981. Al-Rokibah, A., 1991. Leaf blight of date palm caused by Glomerella cingulata in Al-Qassim region. J. King. Saud. Univ., 3: 109-115. Al-sharidy, A. and Y. Molan, 2008. Survey of fungi associated with black scorch and leaf spots of date palm in Riyadh Area. Saudi J. Biol. Sci., 15: 113-118. Alkahtani, M., M.A. El-Naggar, S.A. Omer, Eman, M. Abedl-Kareem and M.F. Ammar, 2011. Effect of toxic Fusarium moniliforme on some biochemical component of some date palm cultivars. Am. J. Food Technol., 6: 730-741. Alshuaibi, A., 2011. The econometrics of investment in date production in Saudi Arabia. Int. J. Applied Econ. Finance, 5: 177-184. Ammar, M.I. and M.A. Najeeb, 2004. New record for false bayoud on date palm (Phoenix dactylifera L.) in Egypt. Egypt. J. Applied Sci., 19: 423-425. Anonymous, 2009. Agriculture statistical yearbook. Agriculture and Water Ministry of Saudi Arabia. Riyadh. Barnett, H.L. and B.B. Hunter, 1972. Illustrated Genera of Imperfect Fungi. 1st Edn., Burgess Publishing Co., Minnesota. Chakroune, K., M. Bouakka, R. Lahlali and A. Hakkou, 2008. Suppressive effect of mature compost of date palm by-products on Fusarium oxysporum f. sp. albedinis. Plant Pathol. J., 7: 148-154. Djerbi, M., 1983. Diseases of the Date Palm (Phoenix dactylifera L.). FAO, Baghdad, Iraq. Duarte, H.S.S., P.G.C. Cabral, O.L. Pereira, L. Zambolim and E.D. Goncalves et al., 2010. First report of anthracnose and fruit mummification of olive fruit (Olea europaea) caused by Colletotrichum acutatum in Brazil. Plant Pathol., 59: 1170-1170. El-Hassni, M., J.L. Verdeil and I. El-Hadrami, 2005. An hypoaggressive Fusarium oxysporum isolate induces polyphenoloxidase activity in the date palm seedlings allowing their protection against the bayoud disease. Plant Pathol. J., 4: 96-102. El-Meleigi, M.A., 2004. First report on two new diseases of date palm (Phoenix dactylifera), rachis blight caused by Seranomyces californica and wilt of fruit bunch caused by Fusarium moniliforme in Saudi Arabia. Proceedings of the International Conference on Date Palm, (CDP'04), Burydah, Saudi Arabia, pp: 49-61. El-Meleigi, M.A., A.A. Al-Rokibah and G.H. Ibrahim, 1986. 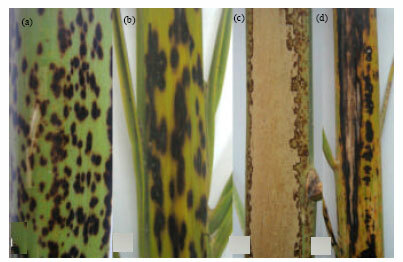 Study of fungal leaf spots of date palms in Al-Qassim Region, Saudi Arabia. Proceeding of the 2nd Symposium on the Date Palm, March 3-6, 1986, Saudi Arabia, pp: 401-410. Elarosi H., 1989. Studies on plants disease affecting date palm trees at the Eastern Province of Saudi Arabia. King Abdul Aziz City Sci. Technol., 26: 79-109. Ellis, M.B., 1971. Dematiaceous Hyphomycetes. 1st Edn., Commonwealth Mycological Institute, Kew, Surrey, UK., ISBN-13: 978-0851986180, Pages: 608. Hernandez, H.J., A. Espino, R.J.M. Rodriguez, A. Perez-Sierra, M. Leon, P. Abad-Campos and J. Armengol, 2010. Survey of diseases caused by Fuasarium spp. on palm tress in the Canary Islands. Phytopathol. Mediterranea, 49: 84-88. Karampour, F. and H. Pejman, 2007. Study on possible influence of pathogenic fungi on date bunch fading disorder in Iran. Acta Hortic., 736: 431-439. Karampour, F., 1999. Report of wilting and defoliation of date fruits in Boushet province. Agricultural Research Center of Boushehr, Iran, pp: 22. Kararah, M.A. and M.I. Ammar, 2003. Heart rot disease of date palm in Egypt. Proceedings of the International Conference on Date Palm, Sept. 16-19, Saudi Arabia, pp: 309-323. Masyahit, M., K. Sijam, Y. Awang and M.G.M. Satar, 2009. The first report of the occurrence of anthracnose disease caused by Colletotrichum gloeosporioides on dragon fruit (Hylocereus spp.) in Peninsular Malaysia. Am. J. Applied Sci., 6: 902-912. Molan, Y.Y., R.S. Al-Obeed, M.M. Harhash and S. El-Husseini, 2004. Decline of date palm offshoots infected with Chalara paradoxa in Riyadh region. J. King Saud Univ., 16: 79-86. Najeeb, M.A.A., 2001. Diseases and pest of date palm. A Guide to Field Investigation and Identification. Agriculture Extension Section, Irrigation and Drainage Authority. Al-Hassa, Ministry of Agriculture and Water, KSA. Paulin-Mahady, A.E., T.C. Harrington and D. McNew, 2002. Phylogenetic and taxonomic evaluation of Chalara, Chalaropsis and Thielaviopsis anamorphs associated with Ceratocystis. Mycologia, 94: 62-72. Sarhan, A.R.T., 2001. A study on the fungi causing decline of date palm trees in middle of Iraq. Proceedins of the 2nd International Conference on Date Palm, March 25-27, 2001, Al Ain, UAE., pp: 424-430. Sheir, H.M., M.Y. Kassim and A.N. Abou-Heilah, 1981. Brown leaf spots of date palm in Saudi Arabia. Egypt. J. Phytopathol., 13: 63-64. Shirazi, M.P., M. Izadi and R. Khademi, 2008. Study the climatical factors effects on bunch fading disorder of date palm in southern Iran and the methods of its control. Am.-Eurasian J. Agric. Environ. Sci., 4: 570-574. Suleman, P., A. Al-Musallam and C.A. Menezes, 2001. 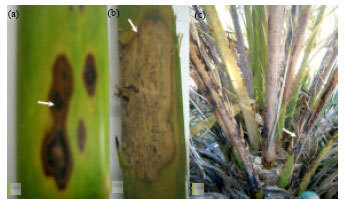 The effect of solute potential and water stress on black scorch caused by Chalara paradoxa and Chalara radicicola on date palms. Plant Dis., 85: 80-83. Suleman, P., A. Al-Musallam and C.A. Menezes, 2002. The effect of biofungicide mycostop on Ceratocystis radicicola, the causal agent of black scorch on date palm. BioControl, 47: 207-216. Zaid, A., P.F. De Wet, M. Djerbi and A.C. Oihabi, 2002. Diseases and Pests of Date Palm. In: Date Palm Cltivation, Zaid, A. and E. Arias-Jimenez (Eds.). Food and Agriculture Organization of the United Nations, Rome, pp: 227-281.